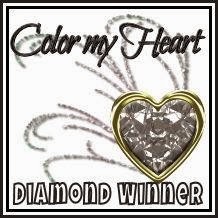 OK, I'll admit that when I first saw the Heart 2 Heart Challenge Round and Round, the song by 80s hairband Ratt started running through my head! 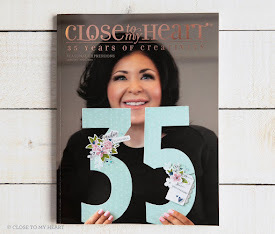 Since finding pictures of my big hair days was maybe too painful and difficult at the moment, I settled on the adorable bicycle cut on the CTMH/Cricut Flower Market cartridge. I have been wanting to use this cut since I got the cartridge! 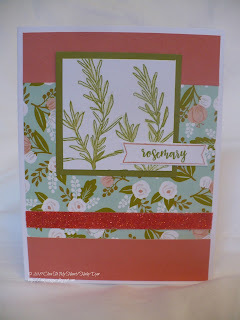 My card uses the Hello Lovely collection. 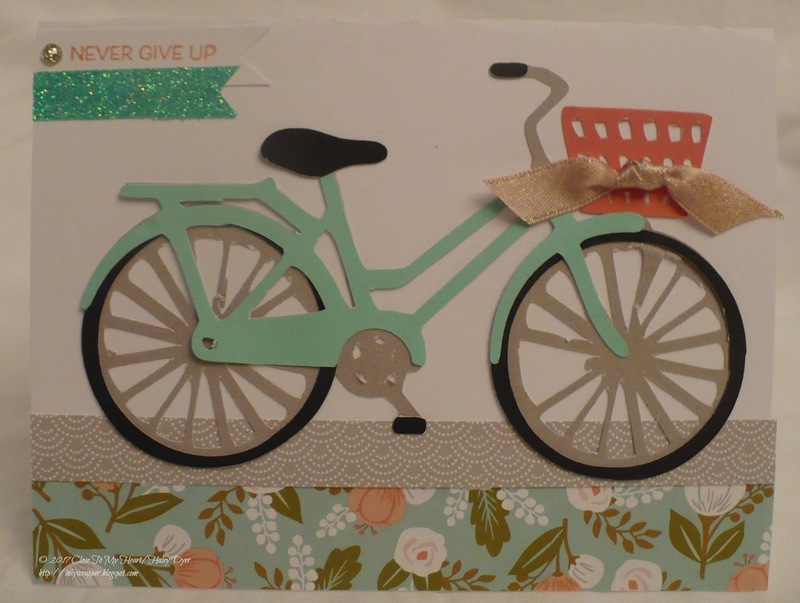 To begin, I cut the bicycle base in Whisper card stock, then Black for the wheel/seat layer, Sea Glass for the bicycle body, and the Sorbet for the basket. I used a strip of the pretty Hello Lovely B&T and a zip strip to create the "road" for my bike. The sentiment comes from the Flower Market stamp set (stamped in Sorbet) and then embellished with a gold glitter gem (also from the Hello Lovely collection) and Aqua shimmer trim. 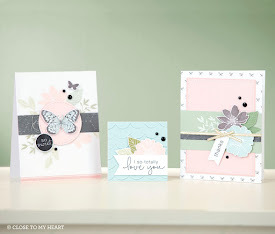 The sweet Blush ribbon can also be found in the Hello Lovely collection. 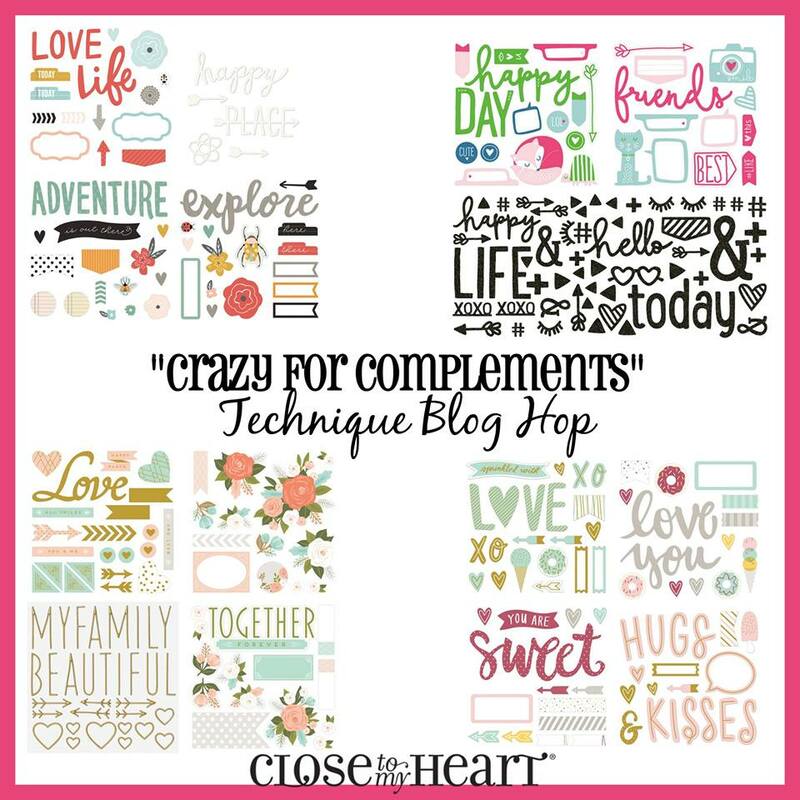 Be sure to see how all of the H2H designers interpreted the Round & Round challenge, and join us for any of the January challenges before the month ends. My Sophomore Year layout uses not one but TWO sets of Complements: the NEW Hello Lovely Complements paired with the School 7-12 Complements. You'll see how I paired them up in the close ups below. 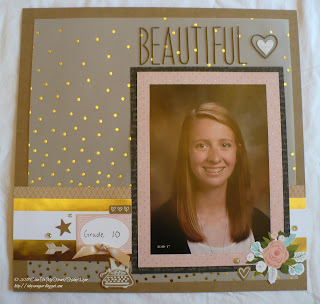 I used quite a collection of products to show off my beautiful daughter's 10th grade school picture. I started with Kraft bases to which I added 11"x11" squares of the gold polka dot vellum from the Uptown Fundamentals paper collection. The gold and white band across the bottom is also from that paper pack. 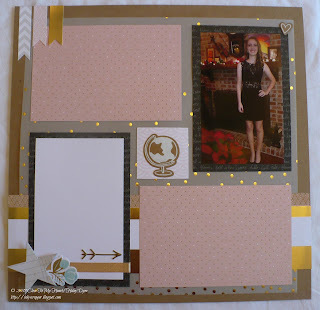 The pale pink paper is from the Hello Lovely paper suite, which the black mattes are from the retired Swan Lake paper. The star is from the School complements and the ribbon, flower sticker, and gold arrow 3-D sticker are from Hello Lovely. Here is the right page. 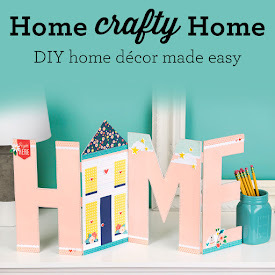 The School chipboard heart nestled inside the 3-D Hello Lovely heart, well, beautifully! 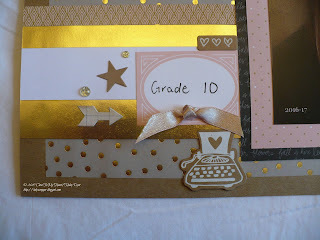 The chipboard pieces are from the School Complements, but the sticker and ribbon are Hello Lovely. 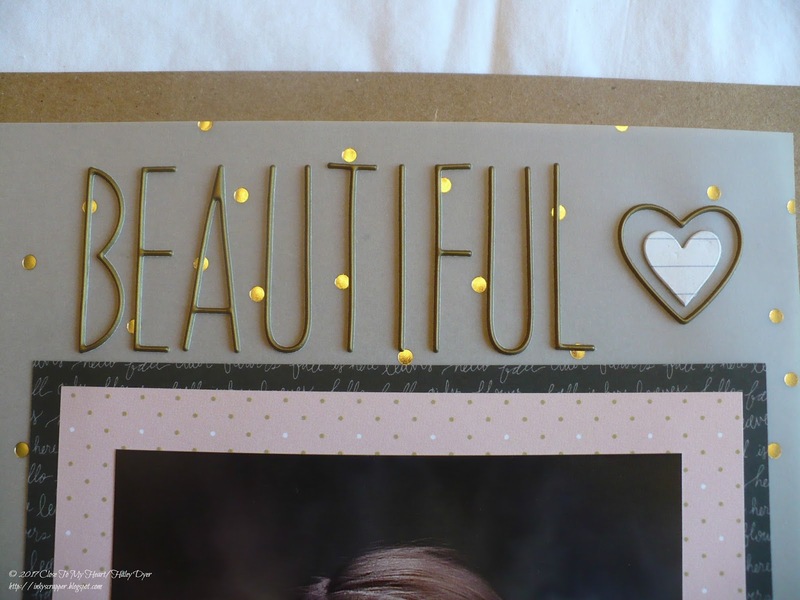 The gold glitter gems are also part of the Hello Lovely collection and can be purchased in a small pack or they come with the Hello Lovely Workshop Your Way. 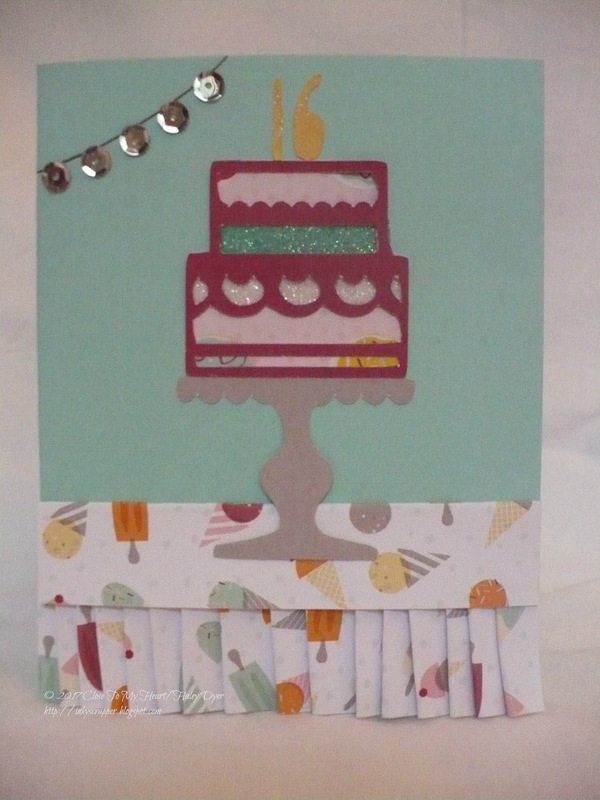 My daughter and her friends are turning 16, so I wanted to make a fun card for the most recent birthday girl. 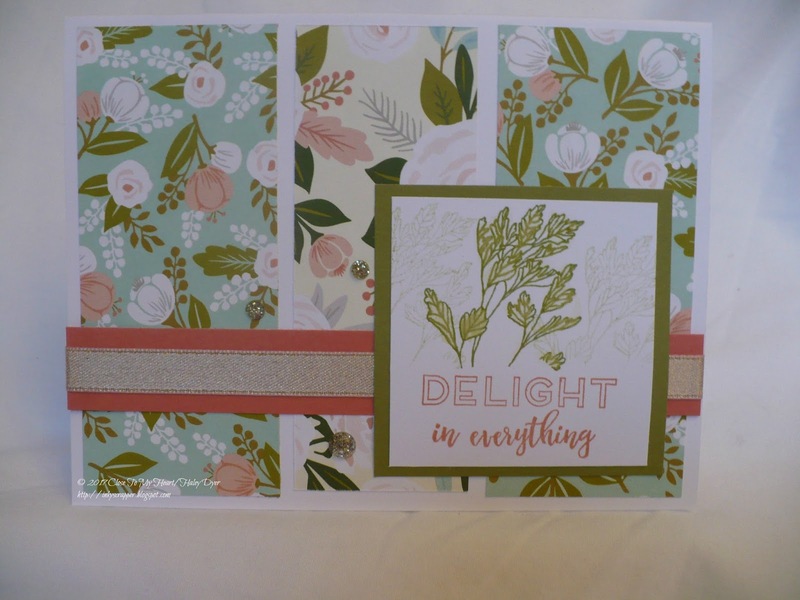 The Sugar Rush paper suite features this cute patterned paper with ice cream on one side and doughnuts on the other. 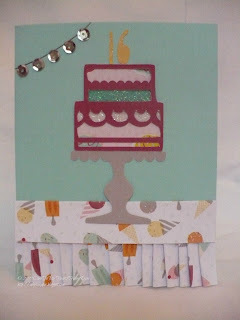 I made the party "table" with the ice cream side: On the Sea Glass card stock base, I pleated a 12" strip across the bottom. The table top is a strip that I folded in half lengthwise to give it more dimension. 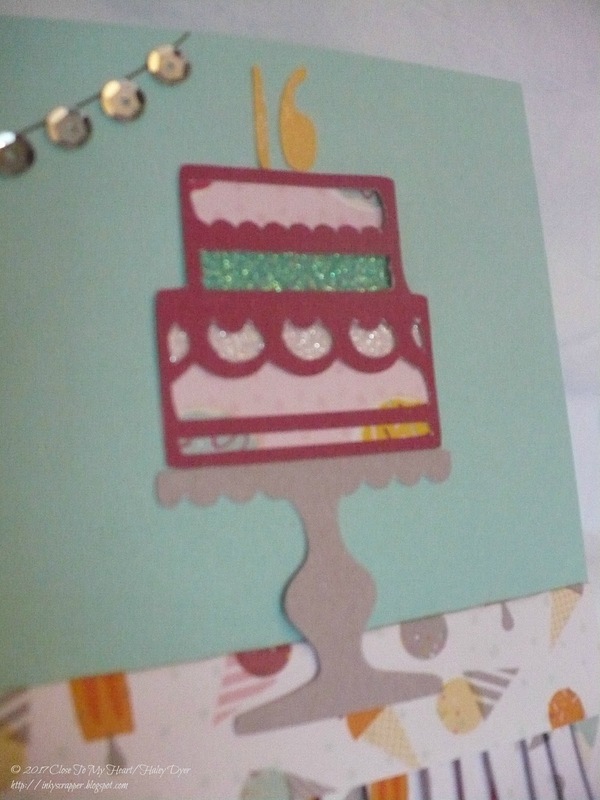 This pretty cake and stand were cut with the CTMH/Cricut Flower Market cartridge. I added a strip of aqua and a strip of white Shimmer Trim to dress up the cake. The 16 "candles" are also cut with the Flower Market cartridge. I used my clear Shimmer Brush to add a little sparkle to the candles. 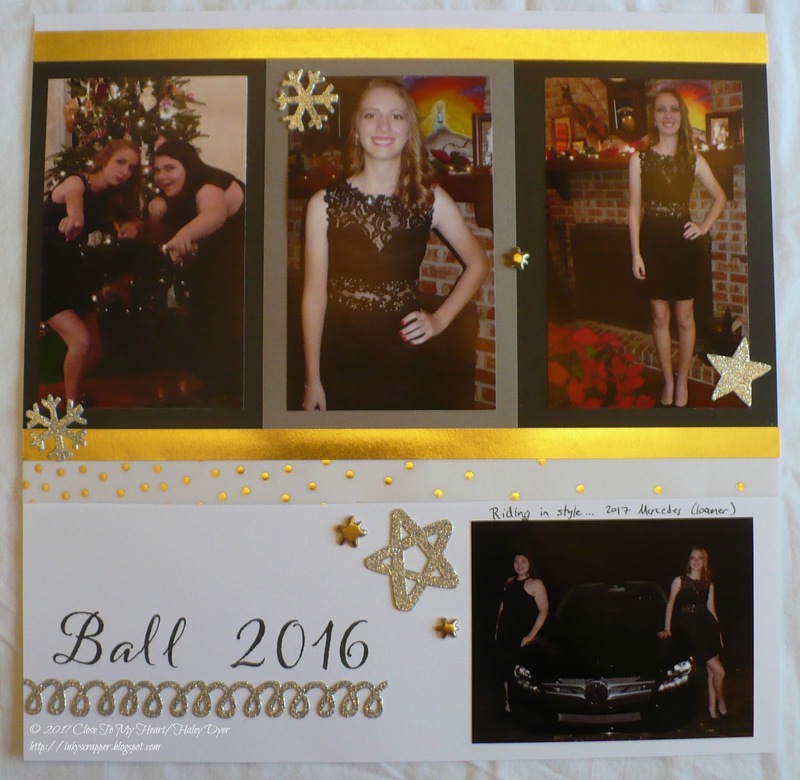 Finally, I made the party pennant with the journaling pen and silver sequins. Thanks for hopping by! 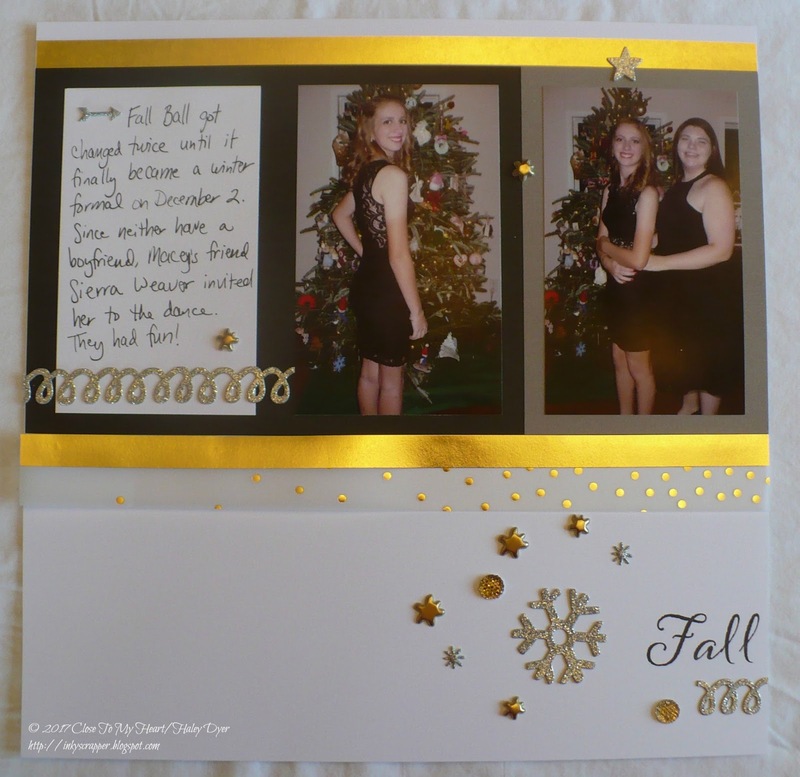 I would love a comment before you head off to check out Melissa's beautiful Seasonal Expressions 1 project. 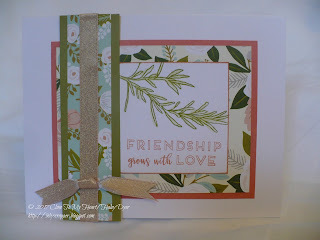 When my teammate suggested the "Season of White" challenge for the Heart2Heart blog, I thought that I would create a white card of some sort, but of course that isn't what happened at all. 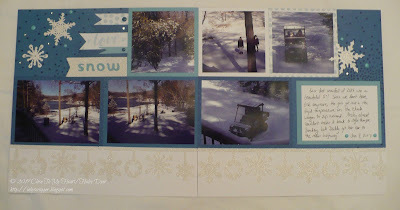 Inspiration struck when we were hit with our first snowstorm of the year, a literal blanket of white! 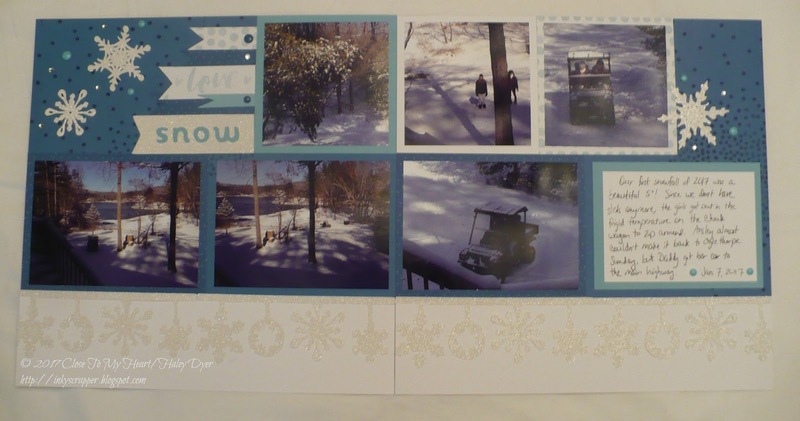 I quickly sent off my pictures to our local Walmart for developing so that I could scrapbook them right away. 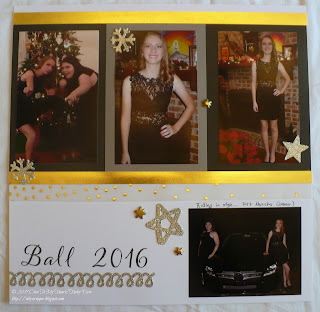 My photos dictated my color palette of Pacifica, Crystal Blue, and White Daisy. 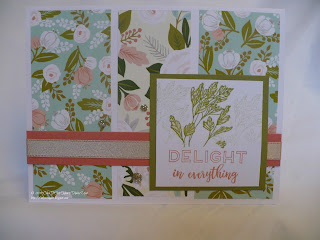 I pulled our card stock in all three colors, then grabbed my Whimsy and Adventure Fundamentals packs to see what kind of patterned paper I had in my color scheme. 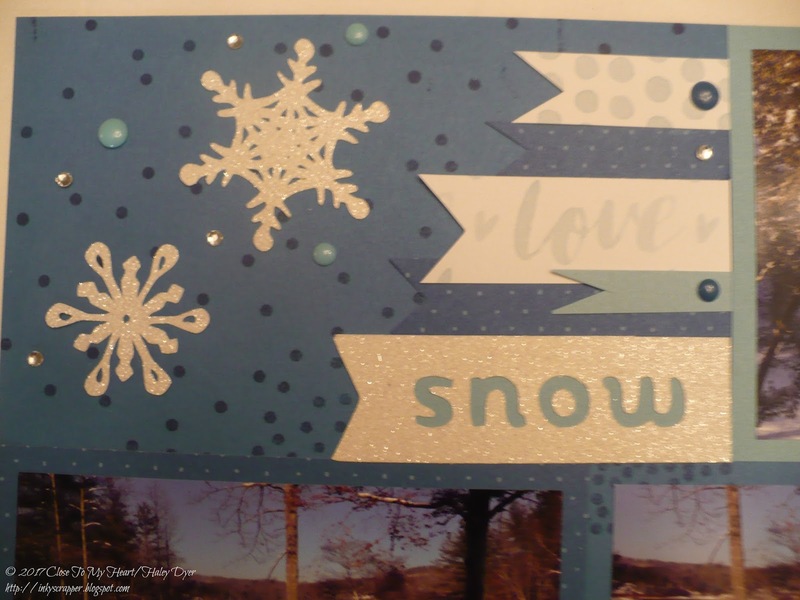 I love using the two different polka dot patterns from the two paper packs, which inspired me to stamp the "snowfall" polka dots from the Charming Cascades stamp set in Pacifica on the Pacifica card stock. I knew that I just had to use my new white glitter paper on this snowy layout. 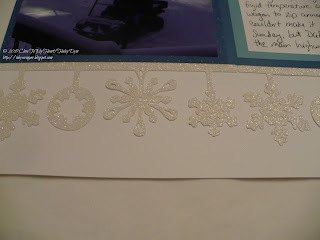 I fell in love with the snowflake border from the CTMH/Cricut Artbooking cartridge (cut four times at 11-1/2"). The "snow" pennant and snowflakes were all cut from that one Cricut key. The rest of the pennants were cut by hand. 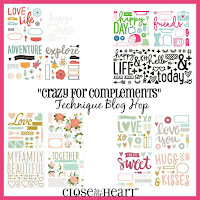 The "love" sentiment is actually one of the patterns of the Whimsy Fundamentals. To add a little sparkle and pizzazz, I embellished my layout with Sparkles and Blue Enamel gems. 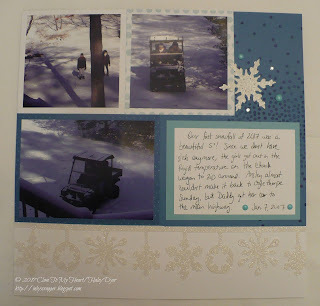 Be sure to visit the H2H blog to see the different interpretations of the Season of White challenge. 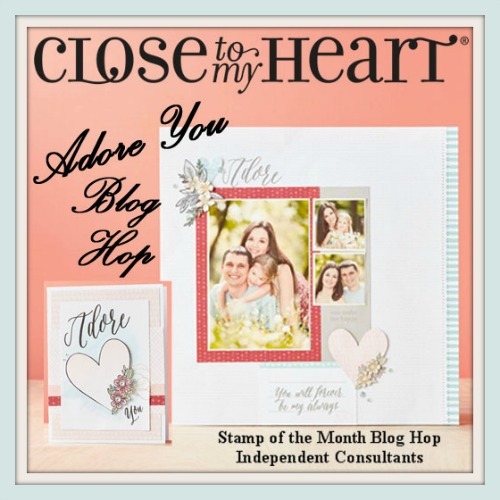 I hope you'll play along with us this month! 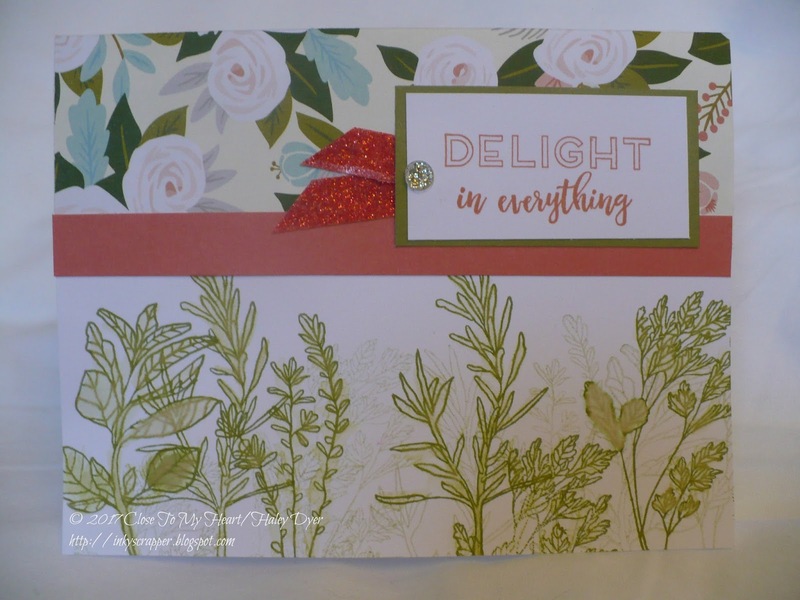 When I first saw the Seasonal Expressions idea book, I fell in love with the Hello Lovely paper suite! I automatically ordered the Workshop Your Way because you get the paper pack, complements, and two different embellishments all at a great price. 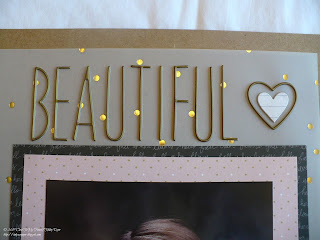 The Hello Lovely WYW includes gold glitter gems and beautiful Blush ribbon. I also had to get the new Good Thymes! 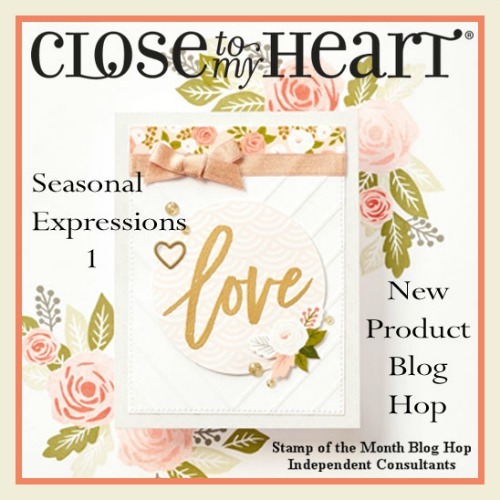 stamp set in honor of my new essential oil business. 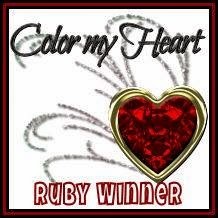 (Feel free to contact me if you'd like to know more.) 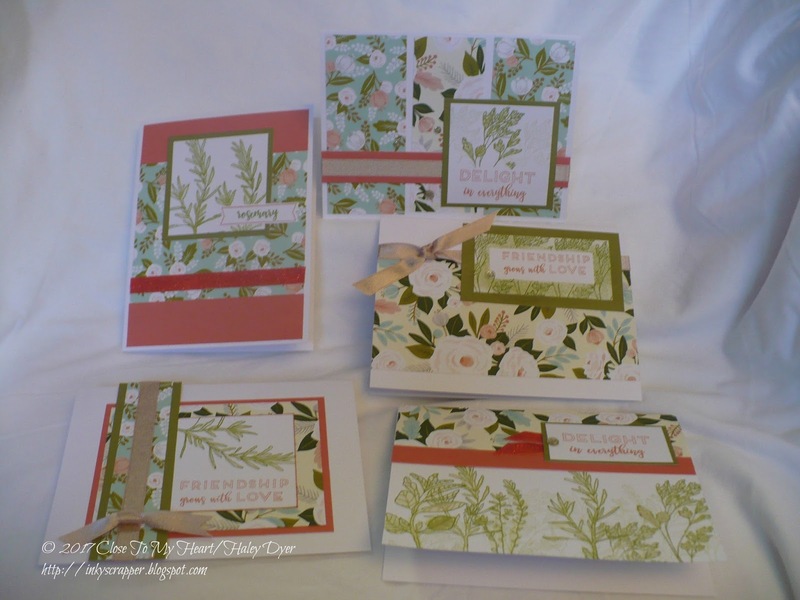 My cards use Fern and Sorbet ink, and I grabbed my trusty holiday five-card workshop (using sketches from Make It From Your Heart, Vol. 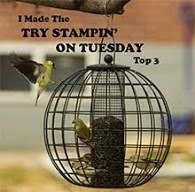 2) and got to work. To color my herbs, I just grabbed my medium round waterbrush and my Fern ink. 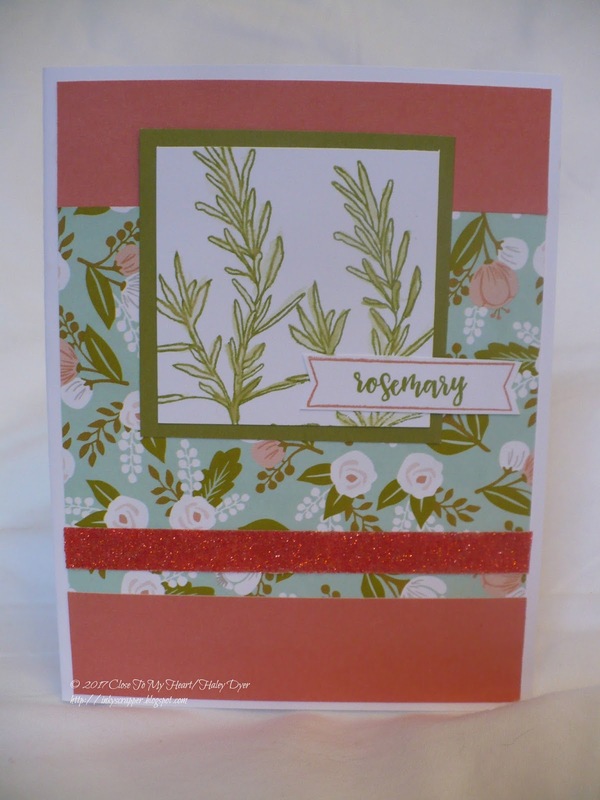 These cards have the addition of coral shimmer trim. 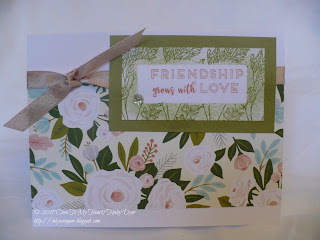 These cards both use the masking technique. Thanks for visiting! 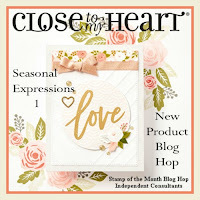 You're going to love all the great ideas you'll find with the new Seasonal Expressions blog hop. 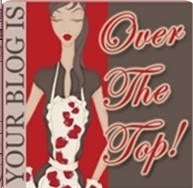 Please leave a comment before hopping on to Jennifer's blog! 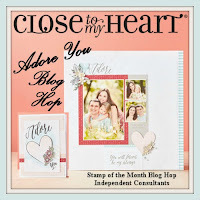 Close To My Heart has a beautiful project available this month that papercrafters of all styles and abilities will love! 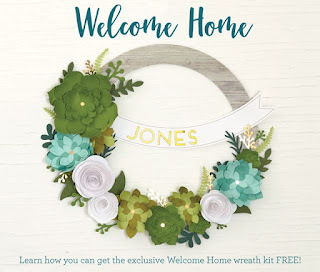 If you buy or earn your kit through me, you're invited to a free workshop on 1/28 to put them together. If you don't have liquid glass, it is absolutely the best adhesive for this project (and so many others). 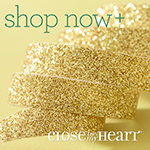 Heart 2 Heart Challenges is ringing in 2017 with a Silver and Gold challenge! Pictures from my daughter's recent Fall Ball seemed like the perfect starting point for this challenge. 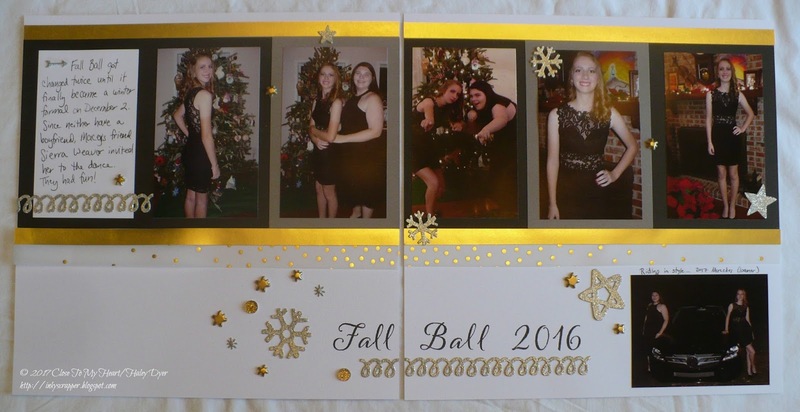 You may wonder why her Fall Ball pictures have a Christmas tree in the background and snowflakes on the layout. They changed the date twice so it ended up being the first weekend in December instead of the original October date. 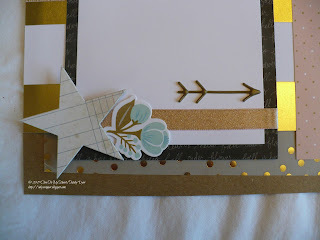 To meet the silver and gold challenge element, I used gold paper and vellum from the Uptown Fundamentals. 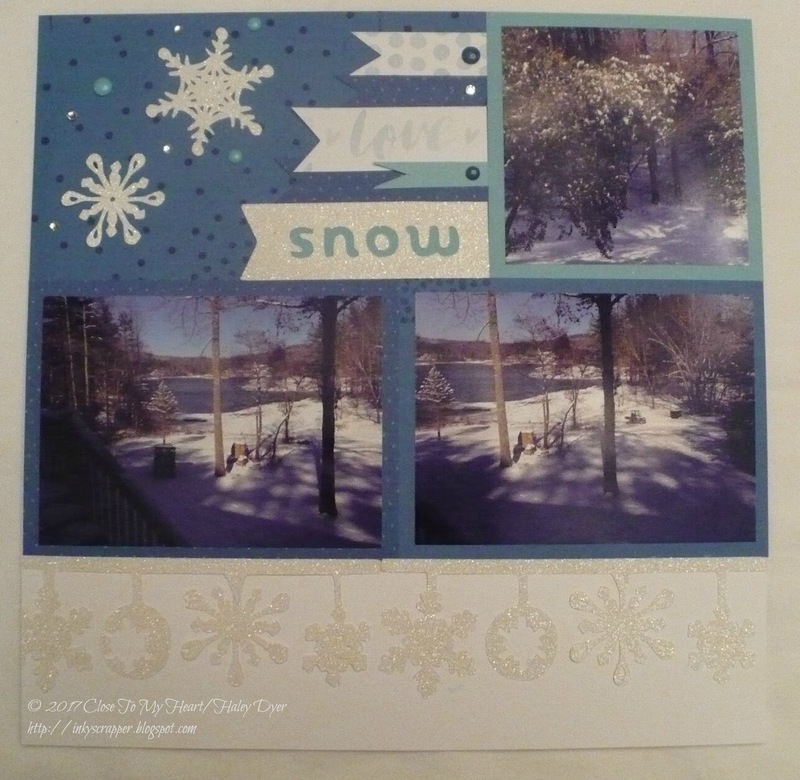 The silver glitter die cut pieces are from the just-retired City Sidewalks Complements. 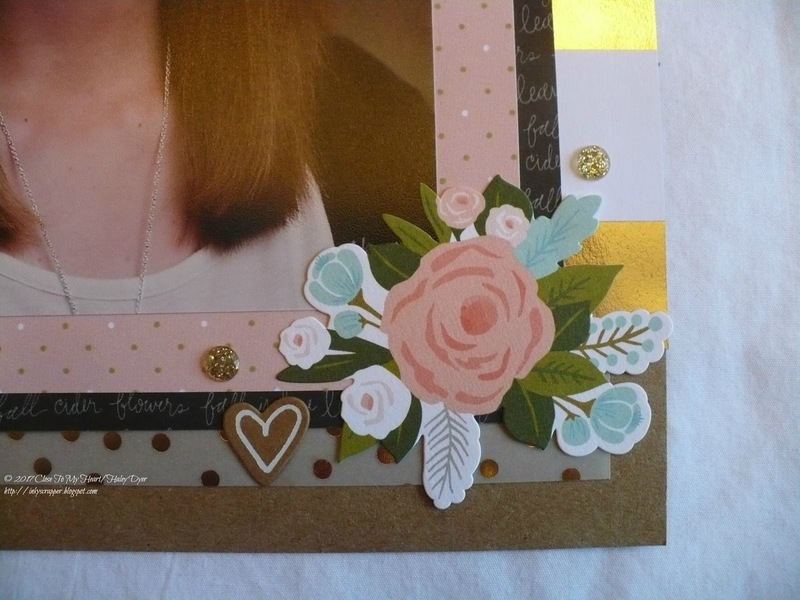 The other gold and silver embellishments are retired pieces leftover in my stash. My title stamp set is also retired, but we offer several pretty ones to choose from now too. 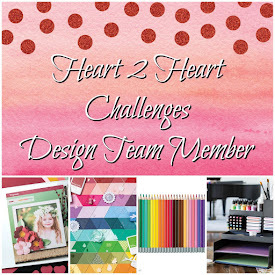 Be sure to visit the Heart2Heart blog to see our entire design team's projects. We hope you will join us in 2017, so why not start today? For my card, I chose some pretty new Adventure colors that you probably wouldn't think of at first glance with this set. 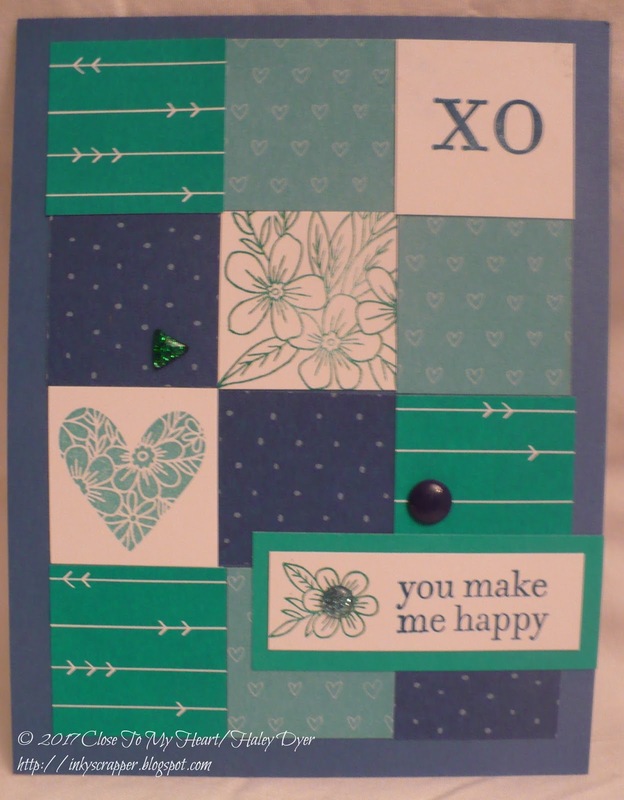 I used Pacifica, Lagoon, and new Emerald. 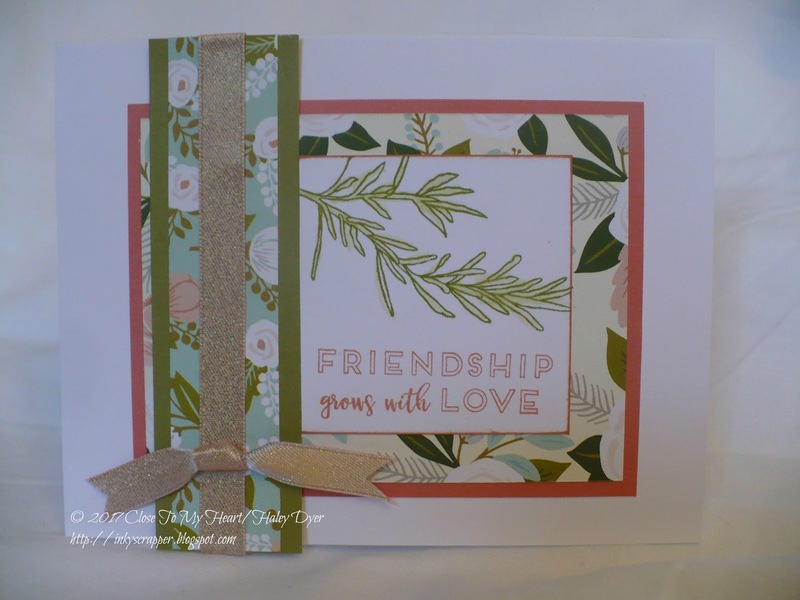 All of the patterned paper is from the Adventure Fundamentals collection. I used a sketch from the retired Lollydoodle collection. Each square measures 1.25". 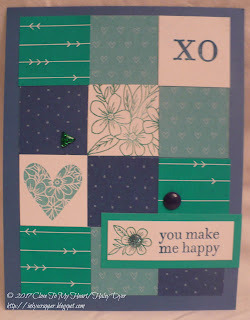 I used some Enamel & Glitter Duos Blue Dots & Green Triangles for my embellishments. Please let me know what you think of my card before leaving to visit Jennifer's blog for the next adorable project!